Hank Young came onto the scene in 2002 by turning up to Daytona Beach Biketoberfest on a bike he built called ‘The Flying Pan‘, a bike which was widely praised in the worldwide motorcycling press. In 2002, he made his “hobby” official and started Young Choppers & Hot Rods. Now Hank specializes in bringing together the vital spirits of motorcycling and hot rodding heritage with technical innovations to create timeless expressions of automotive vision to inspire and thrill us. 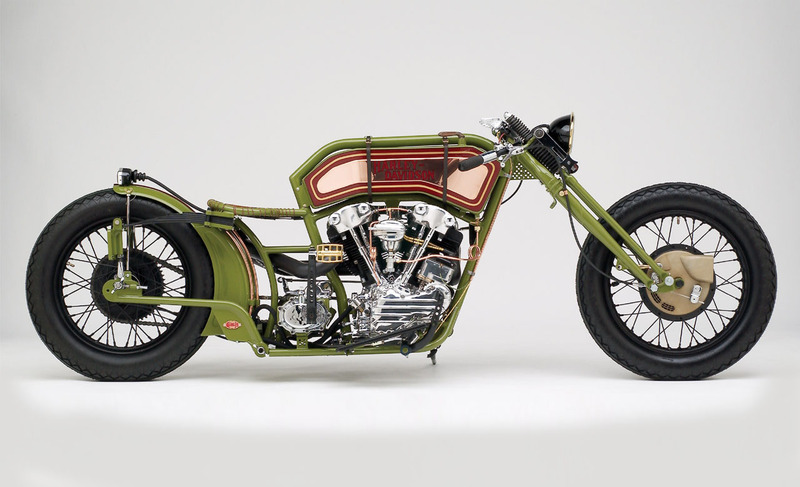 We love this mean, low and green Harley Davidson. For more pics of this tribute to the past check out this gallery.